Frequently Asked Questions » Why does it matter which side of the gas station the plane flew on? Couldn't the plane have flown on the north side of the gas station and still hit the building? The flight path is critical because an approach from the north side of the Citgo gas station not only proves that the official reports and data are fraudulent; it also makes it impossible for the plane to have caused ANY of the physical damage documented inside or outside of the Pentagon. This north side flight path is where the plane is independently placed by all of the witnesses who were in a position to answer this question, including all known eyewitnesses on the actual Citgo property. Those who were in the best locations to observe the plane as it approached from over the Navy Annex also describe a significant right-hand bank, which makes the flight path even more blatantly incompatible with the damage. Please view our documentary National Security Alert if you are unfamiliar with this evidence. A north of Citgo approach is absolutely fatal to the official impact narrative and proves that the plane could not have and did not hit the building, that the damage had to have been caused by pre-planted explosives, and that 9/11 was a full-blown false flag "black operation" with tremendous historical and political implications. Let's take a look at the documented physical damage as it relates to both the official south side flight path and the north side flight path repoted by the eyewitnesses. The physical damage begins with five light poles that were photographed on the ground in the immediate aftermath of the explosion at the Pentagon. They are located along a straight path to the alleged impact spot. Only a plane flying in a straight trajectory on a south side flight path can hit all five light poles. There is virtually no room for error. Even a minor deviation from this flight path would have caused the plane to miss one or more of the poles. A plane on the north side misses all five downed poles, yet would have to fly over other light poles and obstacles which were not struck or downed. 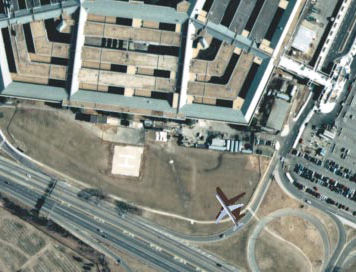 The damage to the Pentagon itself, starting with the facade and leading up to the curious, almost- perfectly round hole in the C ring, is directional, meaning that it delineates a very specific trajectory for the plane. ..this is the damage pattern that we see to the columns inside the building, and you can almost trace the path of the aircraft. This is why we believe it came in at an angle. The key here is, the red dots are where the columns are missing or cut completely. That statement was made while he was showing a slide show containing the following image. The specific trajectory required is the same straight south side flight required for the plane to hit the light poles. The directional damage to the building is also established by the photographic evidence, beginning with the E-Ring "entrance" hole on the	facade of the building and ending with the C-Ring hole, which is labeled "Hole in wall" by the ASCE in the image above. As we saw above, the south side flight path aligns with the damage path from the ASCE report image, and the fuselage lines up with the C-Ring hole. This is not the case with even the closest-possible hypothetical north side flight path, and remember, this path had the plane much closer to the station than all but one witness reported, and does not account for the significant bank reported. With these things taken into account the plane would have hit the building closer to perpendicular, causing a damage path that is even more blatantly inconsistent with the one documented by the ASCE and photographic evidence. Three of the images below are also from the ASCE Building Performance Report, and they all depict a south side flight path. Furthermore, the damage to the generator trailer outside of the building is also irreconcilable with the north side flight path described by the witnesses. On its way in, the wing clipped. Our guess is an engine clipped a generator. We had an emergency temporary generator to provide life-safety emergency electrical power, should the power go off in the building. The wing actually clipped that generator, and portions of it broke off. This allegation was also made by the ASCE. Here is the image that they published on page 20 of their report as Figure 3.14 with the caption "Aircraft at impact with generator". It's impossible for a plane approaching on the north side flight path described by the witnesses to have caused the damage to the generator trailer. The damage to the building is at ground level, and the foundation is relatively undamaged. The ground-level damage is acknowledged by the ASCE. 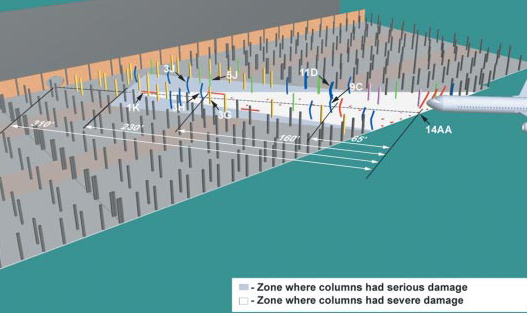 On p. 17, they published the following image, with the caption "Impact location before collapse". With the possible exception of the immediate vicinity of the fuselage’s entry point at column line 14, essentially all interior impact damage was inflicted in the first story: The aircraft seems for the most part to have slipped between the first-floor slab on grade and the second floor. One does not need to consult the ASCE, however, to know that the damage is primarily to the first floor, since it is also documented by the photographic evidence (click a thumbnail to load larger image). 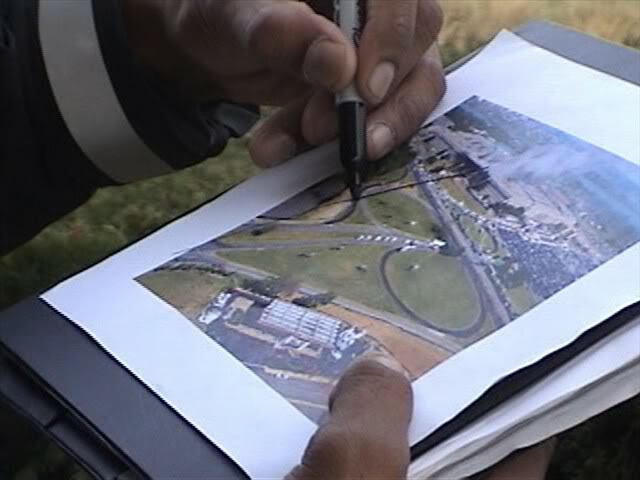 The ASCE does not list any significant damage to the foundation, and it appears relatively undamaged in all of the photographs, such as this one taken by Jocelyn Augustino on 9/21/01, just ten days after the event. However, the photographic evidence shows all poles and obstacles on the north side path fully in tact. So, not only would the plane have missed the downed light poles as it approached from north of the Citgo station, but it also would have flown OVER numerous other light poles and obstacles an instant before reaching the building. This further underscores the fact that the plane did not hit the building, and could only have continued on over the building after clearing all of those obstacles on the north side flight path. As seen in our video National Security Alert, eyewitness Robert Turcios, who was at the Citgo Station, said that he saw the plane "pick up" over the highway to clear these obstacles. "North Approach Impact Analysis" is a tech paper, complete with animations, that formally and scientifically demonstrates that a plane on the north side of the gas station cannot cause the physical damage photographed and documented at the Pentagon, starting with the light poles. Robert Balsamo, an FAA certified pilot and certified flight instructor with 4000+ hours of total flight time, and founder of Pilots for 9/11 Truth. A long-time researcher into the events of that day, he has produced several documentaries on the subject, including 9/11: Intercepted and 9/11: Pentagon Attack. Commander Ralph Kolstad, who has logged 23,000 of flight time. He spent over 20 years in the US Navy flying fighters off of aircraft carriers, achieving TopGun twice. Commander Kolstad also spent 13 years flying Boeing 757/767, mostly as an international captain for American Airlines, and even has command time in tail number N644AA, the very plane dispatched as American 77. It is impossible for any fixed-wing aircraft to cause the directional physical damage to the light poles, generator trailer, and the Pentagon leading to the C-ring hole approaching from directly over the Navy Annex and north of the former Citgo gas station. The flight paths illustrated by the witnesses would require G forces beyond the physical limitations of any aircraft for it to transition to an approach that lines up with the physical damage. Additionally, a hypothetical least challenging scenario at low speed would require bank angles that are irreconcilable with the physical damage, as well as the witness statements, and require an instantaneously performed roll that is impossible for any fixed-wing aircraft. DoD News Briefing on Pentagon Renovation, U.S. Department of Defense transcript, September 15, 2001. "11:00 AM EDT ... Presenters: Mr. Lee Evey, Pentagon Renovation Manager ... Also participating were Rear Adm. Craig R. Quigley, deputy assistant secretary of Defense for Public Affairs and Mr. Terry Mitchell, chief, Audiovisual Division, OASD (PA)." As of February 2015 the slide is still online on the DoD's website, but we have also taken a snapshot of it with WebCite in case the original is later removed. More photographs of the foundation can be found in our article The Lack of Foundation Damage at the Pentagon is Irreconcilable with the Official Reports and Data, Craig Ranke and Robert Balsamo, March 19, 2008.